Aim: To provide an update on artificial saliva used to maintain the health of the oral cavity of patients with severe hyposalivation. Materials and Methods: A literature search was conducted in April 2018 in three electronic databases (The Cochrane Central Register of Controlled Trials [CENTRAL], PubMed, and Embase) by combining key words and terms related to the population and intervention of the topic. Results: The databases search resulted in 455 titles and abstracts. Of these, 21 were judged to meet inclusion criteria and full texts were read. Finally, 10 clinical trials were included for qualitative synthesis. Conclusion: Published evidence suggests that all the artificial saliva products tested in included studies reduced symptoms of xerostomia. These products should specifically be selected according to the patients’ concerns and needs. However, the included studies presented a wide range of products and suffered from high risk of bias. Therefore, long-term randomized controlled trials on effects of various products are required. More than 500 commonly used medications can cause xerostomia such as antidepressants, antihypertensives, opiates, bronchodilators, proton pump inhibitors, antipsychotics, antihistamines, diuretics, and antineoplastics.,, The synergistic effects of combinations of medications also contribute to xerostomia so that although SF does not necessarily decrease with increasing age, the elderly are more likely to have dry mouth because of the increased prevalence of chronic illnesses that have pharmacological treatments associated with the adverse effect of dry mouth sensation. Although drug-induced xerostomia is generally reversible, the conditions for which these medications are prescribed are frequently chronic. Another major cause of xerostomia is radiation therapy for cancers of the head and neck. Xerostomia may also be caused by autoimmune conditions such as Sjögren’s syndrome that damage the saliva-producing cells. Hyposalivation can have a significant impact on the activities of daily living such as speaking, eating, and sleeping and may cause dry mouth, tingling, decreasing sense of taste, dental caries, periodontal diseases, halitosis, oral health costs, difficulty in wearing dentures, and increase in opportunistic infections such as Candida albicans. Increasing elderly population and its dependent use of drugs associated with side effects such as disturbed salivary function put the society at risk of this medico-socio-economic problem. Effective management is required to improve the quality of life (QOL) of patients with xerostomia because of any cause. The main goal of treatment is to relieve clinical symptoms and improve QOL of patients as no curative treatment is available for xerostomia. The therapies available for the management of xerostomia include sialagogues and saliva substitutes, as well as general measures such as sipping water or chewing gum. Symptomatic management of xerostomia is required when saliva production cannot be stimulated effectively. In such cases, saliva substitutes have been considered as treatment alternatives. Artificial saliva preparations are available in different forms such as sprays and gels and are used as a replacement of natural saliva and to mimic its functions. Several studies have been conducted on artificial saliva till now, but the effectiveness in the management of xerostomia is still controversial. The lubrication of the oral mucosa reduces symptoms although the effects last for short duration. A review conducted in 2009 indicated that there is a need for further clinical studies on the properties of saliva substitutes. Since then, a number of papers related to artificial saliva for xerostomia management that have been published are available. Therefore, an update on this topic is necessary to access the current effectiveness of the lubricant treatment and provide a recommendation based on evidence. This review aims to systematically review clinical trials conducted on human in the past 10 years and provide an update on artificial saliva based on the latest available evidence. 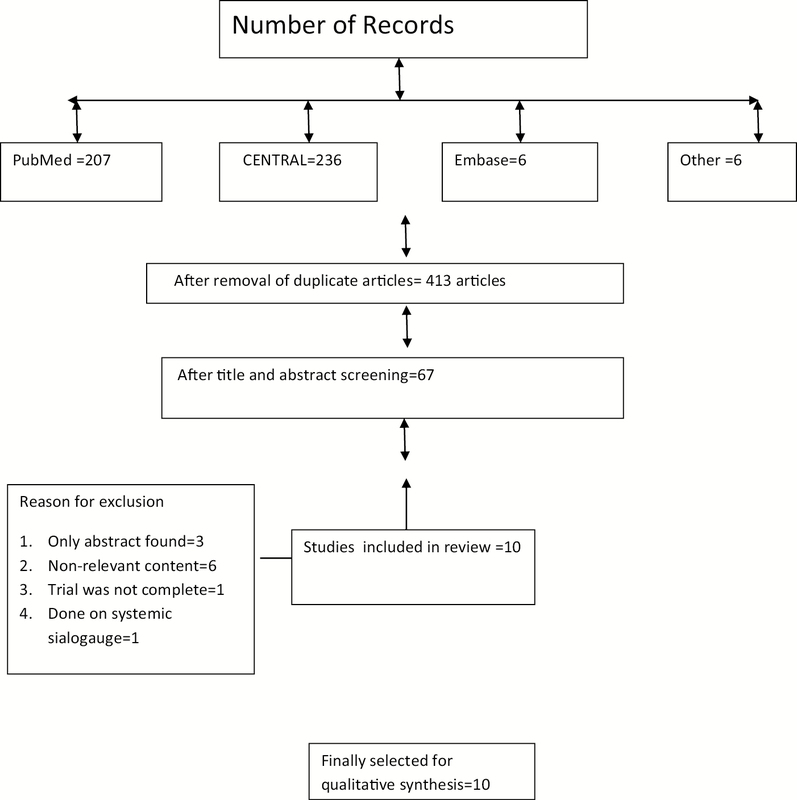 In this review, preferred reporting items for systematic reviews and meta-analyses and Cochrane Collaboration criteria are used as guideline to formulate review question, identify studies and assess their quality of selected studies, data extraction, and reporting. A protocol was developed before starting the search process for this review. Literature search was carried out in electronic databases in April 2018. Cochrane Central Register of Controlled Trials (CENTRAL), PubMed, and Embase were the electronic databases to retrieve the primary studies. In PubMed, filters were used to limit the search to clinical trials conducted on human, published during the past 10 years (from 2009 to 2018). To obtain additional data, a manual search was performed using the reference lists of included articles. Inclusion and exclusion criteria were also considered in hand-searched articles. Parallel group and crossover clinical trials. Articles written in English language only. Studies related to artificial saliva substitutes. Articles related to interaction of artificial saliva with different dental restorations and metals. Trials related to systemic medication or sialagogues. Trials that compared topical treatments with systemic treatments such as oral pilocarpine or oral cevimeline. Duplicate articles were removed. Articles were initially screened by reading the titles and abstracts. Studies not satisfying the inclusion criteria were excluded from the study. The remaining articles were screened in the final stage by reading the full text, and those not meeting inclusion criteria were excluded from the study. The review author and a research assistant assessed all randomized controlled trials, which appeared to meet the inclusion criteria for this review, to confirm eligibility, assess risk of bias, and extract data using a data extraction form. Information was then entered into [Table 1]. Data were recorded under following headings: study title, study author, objective, study population, interventions, and results. Each domain includes one or more specific entries in a “risk of bias” table. Studies were categorized into three categories based on the risk of bias: high risk, low risk, and unclear risk of bias. Studies with one or more domain at high risk of bias were considered to be at high risk. Studies with all domains at low risk were considered to be at low risk. Studies with unclear risk of bias for one or more domains were considered to be at unclear risk of bias. Other sources of bias were assessed as a separate domain. The same review author and research assistant independently carried out the risk of bias assessment as part of the data extraction process. The electronic search identified a total of 455 potential records. A total of 207 articles in PubMed, 236 articles in CENTRAL, and 6 articles were found in Embase. In addition to this, six articles were identified by searching the reference list of relevant studies. Forty-two duplicate articles were found and removed. The same two reviewers who performed electronic search, independently screened titles and abstracts of identified records and selected 67 articles on the basis of inclusion–exclusion criteria. Later, articles published before 2009 were excluded from the study and 21 articles were selected. Full-text copies of these reports were obtained. Of these 21 articles, full text of two articles could not be obtained. Corresponding authors of these two papers were contacted for obtaining full texts but they failed to reply., After evaluation of full texts, 11 studies were excluded. Reasons for exclusion are mentioned in flow chart. A total of 10 trials were included for qualitative analysis [Figure 1]. Nine of the 10 included studies were designed as parallel group studies. Only one study was a crossover study. Placebo was used in only one trial. Regarding the country of origin of the 10 studies, three,, were conducted in Iran, two, in Thailand, one study in each of the following: Italy, Croatia, Japan, and Germany. In one study, the trial site is not clearly mentioned. Four studies received funding.,[18-22] In one study, no financial support was received. No information is available regarding any financial support in five studies. Sample size calculation was carried out in four studies.,,, It was not required in one study as it was an exploratory study. Most of the studies were conducted for 4 weeks.,, A study conducted by Montaldo et al. was of the longest duration among selected studies and was conducted for 6 months. Two studies were conducted for 2 weeks., The duration of one study was 1 week. Six hundred and forty-five was the number of total participants with xerostomia, both drug induced and radiation induced. Among included studies, minimum sample size was of 24 and maximum was of 134. In four studies, the reason of xerostomia was radiation induced,,[19-21] whereas in four studies, it was drug induced.,, One study was conducted on patients with diabetes to determine the effect of diabetes on SF. In one study, patients with neutropenia were included in the study. Oral moisturizing jelly (OMJ): A novel edible saliva substitute compared with commercial artificial saliva gel. Immunologically active saliva substitutes (IASS): Immunologically active salivary substitute containing lactoperoxidase, lysozyme, glucose oxidase, and lactoferrin. (Buccotherm®, Laboratoire Odost, Castera-Verduzan, France), (oral spray based on thermal spring water), Xeros (Xeros®, Dentaid, Barcelona, Spain), (commercially available mouthwash containing betaine, sodium fluoride, and hydroxyethyl cellulose), and marshmallow root (Zagreb City Farmacy, Zagreb, Croatia) (marshmallow root is traditionally used in Croatia to alleviate dry mouth symptoms). Commercially available carboxymethylcellulose (CCMC): CMC is a polymer derived from natural cellulose. It is used in saliva substitute formulation as a thickening agent. King Chulalongkorn Memorial Hospital (KCMH) artificial saliva is a liquid CMC-based preparation that has been compounded and dispensed at KCMH. Oral balance: Commercially available artificial saliva substitute. bioXtra gel (Laclede, Inc., Rancho Dominguez, CA, USA), (commercial synthetic saliva substitute, combination of lactoferrin, lysozyme, and lactoperoxidase). DC161-DP0292 aqueous solution (Pierre Fabre Medical Devices) (glycerol, povidone K30, copovidone, xanthan gum, potassium chloride, xylitol, marshmallow concentrated hydroglycerined extract, anhydrous disodium hydrogen phosphate, potassium dihydrogen phosphate, macrogolglycerol 40 hydroxystearate, potassium sorbate, benzylic alcohol, and pure water) and Aequasyal oily solution (Carilène Laboratory, Montesson, France) (94.4% tri-esters of glycerol oxidized fatty acids of vegetal origin [corn oil]; silicium dioxide; food aromas: orange, grapefruit, and mint; and aspartame). Artificial saliva, 3% citric acid, and distilled water (placebo). Other primary outcomes were patient satisfaction, flow rate of unstimulated whole saliva (UWS), assessment of oral health status in patients with type 2 diabetes mellitus (DM), and total bacterial count on buccal mucosa. Secondary outcome measures were objective dry mouth score, salivary pH, buffering capacity of saliva, SF rate, and any observed adverse events. In a study conducted by Donath et al., the secondary outcome was evaluation of dry mouth over 2h after second application of product. Parameters used for evaluation were the time of onset of action, time of maximum effect, and duration of action. Randomization: Only two of 10 trials were not randomized., In one study, randomized list was generated using Microsoft Excel Inc. USA, version 15, with block randomization method (non-stratified, with the same block lengths). Allocation concealment: It was carried out in two studies., In one of these two studies, only statistician was kept blinded. Selective reporting: All the studies were found to be at low risk of selective reporting bias. Other sources of bias: The study sponsored by a pharmaceutical company and the trial report seemed focused on the product of the same companies. In one trial group, similarity was questionable. Overall risk of bias: Only one study was found to be at low risk of bias. 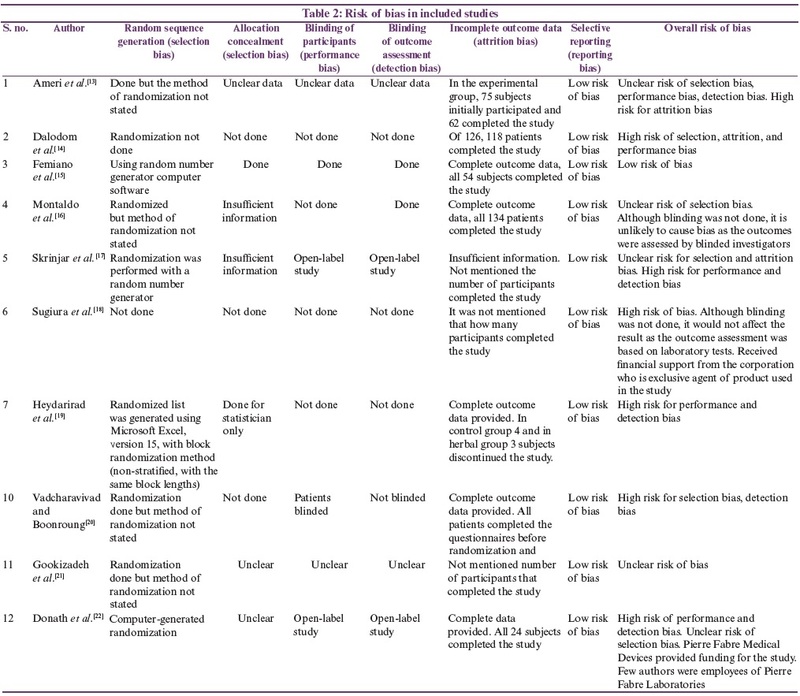 Five studies were judged to be at high risk,[18-20], and four studies were judged to be at unclear risk of bias.,,, Risk of bias for individual studies is discussed in [Table 2]. 1. Herbal versus Hypozalix: The study was a randomized controlled trial conducted in Iran. This study compared the efficacy of herbal products (M. sylvestris and A. digitata) and Hypozalix (Biocodex, France) (artificial saliva) in reducing radiation-induced xerostomia in 62 subjects. The study duration was of 4 weeks and the outcome was measured at the end of 2 weeks and 4 weeks using visual analog scale (VAS). At the end of 4 weeks, significant decrease in VAS score was noticed in herbal group as compared to artificial saliva group. The second study that compared same interventions was also conducted in Iran on 60 subjects with radiotherapy completed 2 months before this study. Sample size calculation was carried out. The outcome measure was QOL, measured using questionnaire. Group was similar at baseline (Heydarirad et al.). The study concluded that study group taking traditional persian medicine preparations experienced improvement in more areas of their xerostomia-associated symptoms as well as QOL as compared to the group using Hypozalix spray. 2. OMJ versus commercial artificial saliva gel: This study was designed as pre-post design and conducted in Thailand. Subjects enrolled were having DM and/or hypertension and received medical therapy for at least 1 year. Initially, 126 patients were recruited and 118 patients completed the study. Primary outcome was patient satisfaction and was measured by subjective dry mouth score. Secondary outcome measures were SF rate, salivary pH, buffering capacities, and objective dry mouth score. Objective dry mouth score was examined for their signs of dry mouth, including loss of pooled saliva, mouth mirror stickiness, stringy or foamy appearance, labial dehydration, and irresponsiveness to parotid stimulation. Approximately 65% of patients selected OMJ and rest 35% preferred commercial artificial saliva gel. The highest preference of OMJ was correlated with easily swallowing, extra deliciousness, and more hydrating. Subjective dry mouth scores reduced 73% at the end of 2 weeks and 88% at the end of 1 month from their baseline data, after using OMJ. In case of objective dry mouth scores, results were not changed significantly at the end of 2 weeks for OMJ, but at the end of 4 weeks, 16% reduction was observed. Increase in buffering capacity and slight increase in SF were noticed after the use of OMJ. 3. IASS: The study was conducted in Italy, which included 134 patients with diabetes. Subjects were randomly divided into two groups of 67 people each. Immunologically active salivary substitutes containing lactoperoxidase, lysozyme, glucose oxidase, and lactoferrin were provided to one group for 6 months. The set provided to trial subjects included toothpaste, mouthwash, and a moistening gel. Instructions were given to brush teeth thrice daily with the set toothpaste and to rinse with the set mouthwash. Subjects were told to apply the supplied moistening gel to their tongue and gums at night and whenever they feel dry. The second group was not provided anything. Patients in both groups were told not to change their eating, drinking, or smoking habits. Patients who were not given salivary substitutes showed a higher risk of having both gingivitis, positive yeast counts, and a higher amount of plaque. 4. Buccotherm, Xeros, and marshmallow root: Randomized, open-label study was conducted on 60 patients with mean age of 64 years, having drug-induced hyposalivation. Patients with unstimulated SF rate <0.2mL/min were randomized into three groups. In the first group, 30 patients were using Buccotherm; in the second group, 15 patients were using Xeros; and in the third group, 15 patients were using marshmallow root. Duration of study was 2 weeks. Patients were instructed to use one of the products four times a day. Primary outcome measure was QOL, assessed by oral health impact profile questionnaire. The second outcome measure was feeling of dryness, assessed by VAS. The study found that all three saliva substitutes showed significant improvement but Buccotherm was superior to Xeros and marshmallow root. 5. CCMC and KCMH: This questionnaire-based study conducted in Thailand included 50 subjects with 50.6 years of mean age. Subjects completed radiotherapy for at least 1 month before enrollment in the trial. Outcome measures were severity level of xerostomia and xerostomia-related QOL. It was found that commercially available CMC-based saliva substitute showed better outcomes in improving the severity of xerostomia, speech difficulty, taste alteration, and frequency of sipping water compared with KCMH after 14 days. 6. Oral balance: The study included 18 patients with neutropenia undergoing hematopoietic cell transplantation and 10 healthy subjects in control group. Outcome measure was total bacterial counts on buccal mucosa assessed by quantitative polymerase chain reaction amplification of 16s rDNA. It concluded that no significant increase in bacterial counts was observed, associated with the use of Oral balance. The study may be subject to high risk of bias as it received financial support from corporation, which was exclusive agent of product used in this study. 7. bioXtra gel: The study was conducted to evaluate the efficacy of bioXtra gel in improving radiation-induced xerostomia, lactobacillus colony count, C. albicans in the saliva cultures, and oral cavity PH. A total of 55 patients with radiation-induced xerostomia were included in the study. Patients received two bioXtra gel for 2 weeks (one spoon, three times a day). Assessment was carried out of xerostomia, swallowing, and oral cavity examined for infections and teeth condition initially and after 2 weeks. Oral cavity pH, lactobacillus colony count, and C. albicans were checked in laboratory. The study indicated a significant superiority of bioXtra gel for xerostomia during the day and speech impairment, but it did not indicate significant effect in swallowing xerostomia. The bioXtra gel increased the pH. 8. DC161-DP0292: This was an exploratory, randomized, open‐label, active‐controlled, four‐period, and crossover study conducted at a single center in Germany. Three formulations (two aqueous and one oily) of DC161 oral spray, a new saliva substitute, and an active comparator, Aequasyal oral spray (oily), were assessed for clinical efficacy in terms of their relief on drug‐induced xerostomia and other associated symptoms. The subjective intensity of various symptoms was self‐assessed by the subject using a 100-mm VAS, a validated and well‐described assessment tool. The four periods of 1-day study were separated by a washout of 3days maximum. A total of 40 subjects were screened, of which 24 were selected for the study. All subjects completed the study. Of the three DC161 formulations tested, only DC161‐DP0292 showed a reduction in mouth dryness. Subjects’ overall evaluation of the product was higher for DC161‐DP0292 than comparator, following both applications were not blinded, both the investigator and the subjects were aware of the formulations being investigated and could bias the subjective assessments. 9. Artificial saliva, 3% citric acid, and distilled water: A total of 78 patients complaining of a sensation of dry mouth were clinically evaluated, of these, 54 were selected for the study. At the end of the study (30 days), all patients were evaluated by investigator, who was blinded to the form of therapy given to each group. All patients completed the study. After 15min. of solution intake, 12 patients (67%) belonging to the artificial saliva group, 9 (50%) from the citric acid group, and 2 (11%) from the water group reported significant symptomatological improvement. After 1h of solution intake, 7 patients (39%) from the artificial saliva group, 10 (56%) from the citric acid group, and 0 from the water group noted significant symptomatological improvement. Both salivary substitutes and citric acid proved to be effective against dry mouth, but 3% citric acid provided a longer lasting beneficial effect in relief of the dry mouth feeling compared with salivary substitutes 1h after use. Neither the 3% citric acid nor the saliva substitutes affected the UWS flow rate. The studies included in this review evaluated a range of different interventions and were mostly found to be at high or unclear risk of bias. Therefore, due to lack of evidences, it was difficult to conclude the most effective product or intervention. However, the findings of all the studies included in this review were summarized. Four studies were conducted on subjects with drug-induced xerostomia. In a study conducted by Skrinjar et al., all tested agents Buccotherm, Xeros, and marshmallow root showed beneficial effect in alleviating hyposalivation symptoms and improvement in QOL, but Buccotherm was found to be superior to other two. Results of one study showed that the use of OMJ for 2 weeks significantly reduced the symptoms of dry mouth, whereas the use for 1 month reduced the signs of xerostomia, prevented the decline of salivary pH, and improved buffering capacities. OMJ was equally effective in patients taking 1–2 and 3–7 medications. Furthermore, 65% of patients preferred OMJ over a commercial product. An aqueous formulation—DC161‐DP0292—reduced the intensity of dryness of mouth at least as well as the comparator, Aequasyal oral spray; DC161‐DP0292 provided a fast relief and a long‐lasting effect on mouth dryness. Both products improved other symptoms such as swallowing and speaking, even when applied just before a meal. A study conducted by Femiano et al. showed that both artificial saliva and citric acid provided immediate relief from oral dryness. Citric acid also provided a longer lasting feeling of oral moistness at 1h after use owing to its protracted activity on salivary gland function. None of the drugs tested affected UWS flow. bioXtra gel relieved xerostomia during the day and night and speech impairment, but xerostomia, while eating and drinking water during a meal, indicated no significant difference after 2 weeks. In addition, bioXtra gel increased the PH and the candida counts, commercially available CMC-based saliva substitute was found effective in improving the severity of xerostomia, speech difficulty, taste alteration, and frequency of sipping water after 14 days of treatment. Results suggest that relief from radiation-induced xerostomia during swallowing was provided by CMC-based saliva substitutes used by Vadcharavivad and Boonroung and not by bioXtra. All four studies used questionnaire or VAS to measure outcomes; therefore, lack of objective outcome measures for assessment may introduce bias. More clinical trials with large sample size addressing this issue are required. In this category, two studies were included that do not fall into aforementioned two categories; one study included patients with neutropenia undergoing hematopoietic cell transplantation and the other was conducted on patients with type 2 DM. A study conducted by Montaldo et al. concluded that a therapy with IASS can be useful in the reduction of the amount of plaque, gingivitis, and positive yeast counts. The use of Oral balance may reduce symptoms caused by hyposalivation without promoting infection. A similar review carried out in 2009 by Hahnel et al. suggested that significant differences are present in various saliva substitutes concerning the review parameters and indicated that further studies need to be conducted on the properties of saliva substitutes. After 10 years from the latter review, there is a lack of strong evidence available. However, all the tested products reduced the dryness of mouth; the effect lasted for short duration. There is no effective treatment for xerostomia till now. Therefore, there is a need to find and test newer products for their efficacy. A recent study concluded that artificial salivary substitutes with its biological, rheological properties can be a great adjunct influencing the success of prosthodontic treatment by restoring the health of dehydrated mucosa. Available saliva substitutes for xerostomia management should be used according to the individual patient’s concerns, preferences, and oral health needs. Patient’s current oral health status, hygiene regime, and compliance should be considered while making a treatment plan for patients with xerostomia. This review was limited to the last 10 years and to English language studies, which may preclude some information about the topic to be retrieved. Gray literature was not considered. Full texts of two studies were not found after contacting the authors as they did not reply., Therefore, those studies could not be included in this review, which may cause bias. This review may be subject to publication bias as unpublished literature was not included in the study. Well-designed randomized controlled trials for dry mouth are required to provide evidence to improve clinical care. Patient satisfaction is an important consideration. Therefore, crossover trials, a design that allows more efficiency in determining patient preferences, would be more appropriate. The studies included in this review were carried out on different artificial saliva products; therefore, it is challenging to reach a definite conclusion. Nevertheless, published studies suggest that all tested products reduced signs and symptoms of xerostomia. Herbal products were reported to show more improvement than artificial saliva in case of radiation-induced xerostomia. Oral spray presentation and 3% citric acid provide a long‐lasting effect on drug-induced xerostomia. Products that improved dryness symptoms during swallowing and speaking were OMJ, oral spray (Aequasyal), and DC161‐DP0292 in case of drug-induced xerostomia. Management of xerostomia may be performed in combination of available products according to the individual patient’s concerns, preferences, and oral health requirements. It was not possible to compare efficacy to reduce signs and symptoms of products because of heterogenicity among studies in terms of study product, site, and duration. In addition, most existing studies had high risk of bias. Therefore, there is a need of more randomized controlled trials on effects of various products conducted according to Consolidated Standards of Reporting Trials (CONSORT) statements with large sample size to reach an unbiased conclusion. Tenovuo J, Lagerlöf F. Saliva. In: Thylstrup A, Fejerskov O, editors. Textbook of clinical cardiology. 2nd ed. Copenhagen, Denmark: Munksgaard; 1994. Edgar M, Dawes C, O’Mullane D. Saliva and oral health. 3rd ed. London, UK: BDJ Books; 2004. Dawes C. Physiological factors affecting salivary flow rate, oral sugar clearance, and the sensation of dry mouth in man. J Dent Res 1987;66:648-53. Axelsson P. Diagnosis and risk prediction of dental caries. Vol. 2. Batavia, IL: Quintessence Books; 2000. Douglas CR. Tratado de fisiologia aplicada à saúde. 5th ed. São Paulo, Brazil: Robe Editorial; 2002. Thelin WR, Brennan MT, Lockhart PB, Singh ML, Fox PC, Papas AS, et al. The oral mucosa as a therapeutic target for xerostomia. Oral Dis 2008;14:683-9. Gupta A, Epstein JB, Sroussi H. Hyposalivation in elderly patients. J Can Dent Assoc 2006;72:841-6. Mouly SJ, Orler JB, Tillet Y, Coudert AC, Oberli F, Preshaw P, et al. Efficacy of a new oral lubricant solution in the management of psychotropic drug-induced xerostomia: a randomized controlled trial. J Clin Psychopharmacol 2007;27:437-43. Sreebny LM, Valdini A, Yu A. Xerostomia. Part II: relationship to nonoral symptoms, drugs, and diseases. Oral Surg Oral Med Oral Pathol 1989;68:419-27. 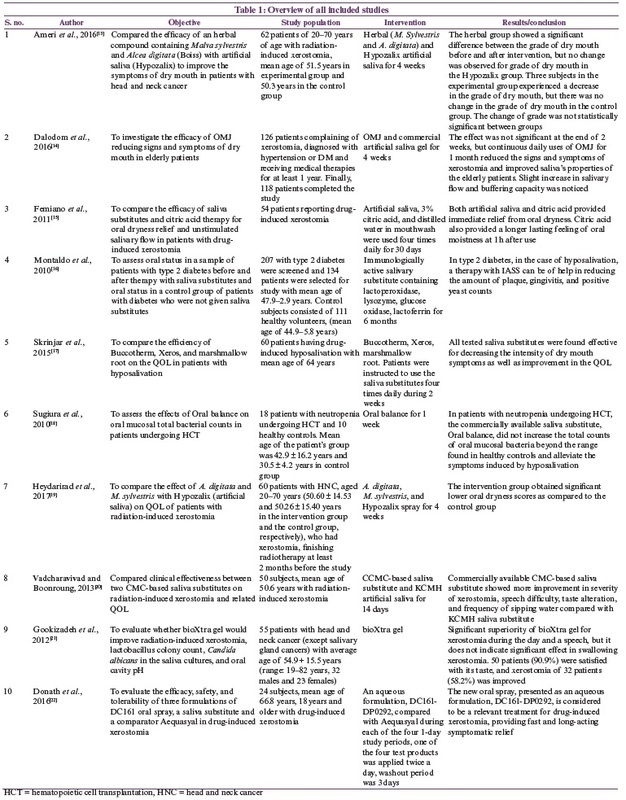 Löfgren CD, Wickström C, Sonesson M, Lagunas PT, Christersson C. A systematic review of methods to diagnose oral dryness and salivary gland function. BMC Oral Health 2012;12:29. Gil-Montoya JA, Silvestre FJ, Barrios R, Silvestre-Rangil J. Treatment of xerostomia and hyposalivation in the elderly: a systematic review. Med Oral Patol Oral Cir Bucal 2016;21:e355-66. Hahnel S, Behr M, Handel G, Bürgers R. Saliva substitutes for the treatment of radiation-induced xerostomia—a review. Support Care Cancer 2009;17:1331-43. Ameri A, Heydarirad G, Rezaeizadeh H, Choopani R, Ghobadi A, Gachkar L. Evaluation of efficacy of an herbal compound on dry mouth in patients with head and neck cancers: a randomized clinical trial. J Evid Based Complementary Altern Med 2016;21:30-3. Dalodom S, Lam-Ubol A, Jeanmaneechotechai S, Takamfoo L, Intachai W, Duangchada K, et al. Influence of oral moisturizing jelly as a saliva substitute for the relief of xerostomia in elderly patients with hypertension and diabetes mellitus. Geriatr Nurs 2016;37:101-9. Femiano F, Rullo R, di Spirito F, Lanza A, Festa VM, Cirillo N. A comparison of salivary substitutes versus a natural sialagogue (citric acid) in patients complaining of dry mouth as an adverse drug reaction: a clinical, randomized controlled study. Oral Surg Oral Med Oral Pathol Oral Radiol Endod 2011;112:e15-20. Montaldo L, Montaldo P, Papa A, Caramico N, Toro G. Effects of saliva substitutes on oral status in patients with type 2 diabetes. Diabet Med 2010;27:1280-3. Skrinjar I, Vucicevic Boras V, Bakale I, Andabak Rogulj A, Brailo V, Vidovic Juras D, et al. Comparison between three different saliva substitutes in patients with hyposalivation. Clin Oral Investig 2015;19:753-7. Sugiura Y, Soga Y, Yamabe K, Tsutani S, Tanimoto I, Maeda H, et al. Total bacterial counts on oral mucosa after using a commercial saliva substitute in patients undergoing hematopoietic cell transplantation. Support Care Cancer 2010;18:395-8. Heydarirad G, Rezaeizadeh H, Choopani R, Mosavat SH, Ameri A. Efficacy of a traditional Persian medicine preparation for radiation-induced xerostomia: a randomized, open-label, active-controlled trial. J Integr Med 2017;15:201-8. Vadcharavivad S, Boonroung T. Effects of two carboxymethylcellulose-containing saliva substitutes on post-radiation xerostomia in head and neck cancer patients related to quality of life. Asian Biomed 2013;7:93-202. Gookizadeh A, Emami H, Najafizadeh N, Roayaei M. Clinical evaluation of BIOXTRA in relieving signs and symptoms of dry mouth after head and neck radiotherapy of cancer patients at Seyed-Al-Shohada Hospital, Isfahan, Iran. Adv Biomed Res 2012;1:72. Donath F, Tonner F, Chavda R, Gatignol JP, Bouyrie J. Randomized trial of the efficacy and safety of a new oral spray for drug-induced xerostomia. Clin Exp Dent Res 2016;2:112-20. Salom M, Hachulla E, Bertolus C, Deschaumes C, Simoneau G, Mouly S. Efficacy and safety of a new oral saliva equivalent in the management of xerostomia: a national, multicenter, randomized study. Oral Surg Oral Med Oral Pathol Oral Radiol 2015;119:301-9. Milleman JL, Milleman KR, Santos SL, Proskin HM, Battershell KK, DiMarino JC. Subjective assessment of Enamelon® preventive treatment gel in a self-reported dry-mouth population. Compend Contin Educ Dent 2016;37:e5-8. Saraswathy B, Ganapathy D. Salivary substitutes in prosthodontics. Int J Recent Adv Multidisciplinary Res 2016;3:1350-2. Dost F, Farah CS. Stimulating the discussion on saliva substitutes: a clinical perspective. Aust Dent J 2013;58:11-7. Mills EJ, Chan AW, Wu P, Vail A, Guyatt GH, Altman DG. Design, analysis, and presentation of crossover trials. Trials 2009;10:27.